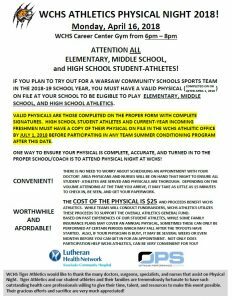 Warsaw Community Schools students wishing to participate in elementary, middle school, or high school athletics in the 2018-19 school year will need a physical on file prior to participation. Additionally, those wishing to condition and participate in summer activities with the high school will need a physical on file prior to participation. Monday’s physical night ( 6pm – 8pm in the Career Center) is a great way to get this important document! Physicals are just $25 and for students entering or attending WCHS, this physical can be filed immediately!